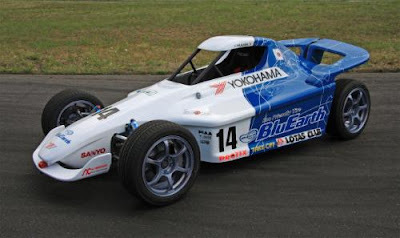 SANYO Electric has announced that its lithium-ion batteries will be used in the Yokohama Rubber electric vehicle operated by "Team Yokohama EV Challenge" for the upcoming hill-climbing motor sports race "2011 PIKES PEAK INTERNATIONAL HILL CLIMB" to be held in Colorado, USA on June 26. Yokohama Rubber has been participating in the race since 2009, with the aim to harmonize the pleasure of driving with the environment and to promote research and development for EV tires. They have used a SANYO lithium-ion battery system for electric motors every year, and last year achieved a new, all-time record for electric vehicles. This year, the team will use a prototype of the fuel-efficient tire BluEarth. To power the EV, the battery system used combines 6,656 of SANYO's 18650-size cylindrical lithium-ion batteries (Diameter: 0.7inch (18mm) x Height: 2.5inch (65mm)), typically used for consumer equipment such as laptops. The 18650-size cells offer the expected performance, and because they are readily available, only a short period of development for use with EV systems is required. SANYO aims to contribute to the realization of a low-carbon society by increasing the use of lithium-ion batteries.